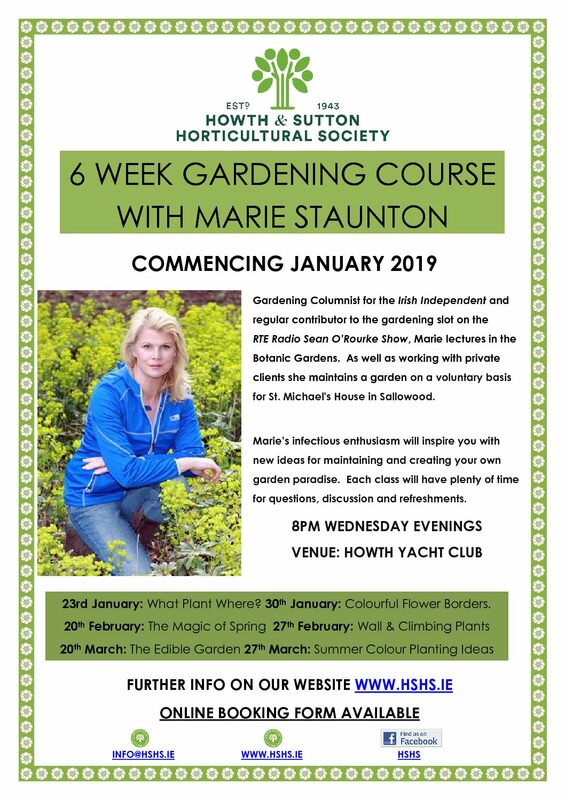 Gardening Columnist for the Irish Independent and regular contributor to the gardening slot on the RTE Radio One Sean O’Rourke Show, Marie lectures in the Botanic Gardens. As well as working with private clients she maintains a garden on a voluntary basis for St. Michael’s House in Sallowood. Marie’s infectious enthusiasm will inspire you with new ideas for maintaining and creating your own garden paradise. Each class will have plenty of time for questions, discussion and refreshments. Choice plants for every garden. Colour and scent all year around is achievable with a little planning.The most important consideration is soil type and aspect when introducing new plants into a garden. Starting a herbaceous border from scratch can be daunting but I will take the stress out of it for you and we will plan it together. Even if you have a small patio we can plan for pots of colour. Spring flowing plants that will coax you back out into the garden. Plant division and preparing the garden for the summer ahead. An Introduction to Wall and Climbing Plants. Choosing the right one for each location in the garden.There are so many to choose from to hid a dull wall or disguise an oil tank. When it comes to growing fruit and vegetables it’s all about location, location, location. Pest and disease control is achievable organically without harming your own pets and wildlife! Planting ideas for flower borders and pots for summer colour. Achieving the right mix of plants for summer colour is down to good planning. Cost: €100 including HSHS membership for 2019, six evening classes and refreshments.